Digiarty Software today announced the release of its remolded freeware – WinX Free DVD Ripper. Now this free DVD ripper is proved to be the fastest DVD Ripper freeware for ripping DVD to MP4, WMV, iPhone, PSP, etc. while supporting CSS, ARccOS and other copy protections. 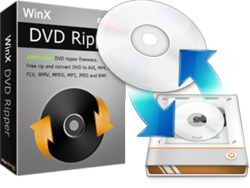 WinX Free DVD Ripper has been upgraded to be the fastest DVD ripper freeware even capable of ripping DVDs with troublesome copy protections such as CSS, RCE, UOP and Sony ARccOS, and backup DVD to MP4, MPEG, WMV, iPod, iPhone, etc. Today, Digiarty Software Inc. (http://www.winxdvd.com) released its remolded DVD ripper freeware – WinX DVD Ripper. Accordingly, this ripper has been upgraded to be the fastest DVD ripper freeware even capable of ripping DVDs with troublesome copy protections such as CSS, RCE, UOP and Sony ARccOS, and backup DVD to MP4, MPEG, WMV, iPod, iPhone, etc. The aim of rebuilding is to make WinX DVD Ripper the best free DVD ripper. One of the most outstanding improvements lies in the DVD ripping speed. This absolutely free DVD ripper is upgraded to provide faster DVD ripping process with built-in Hyper-threading and Super Encode Engine based on MMX-SSE & 3DNow. According to Digiarty official test, it is by now the fastest free DVD ripper software in the world. The test indicates that it rips DVD 3x – 5x faster than some like freeware in the market, and the DVD ripping speed can even rival some charged DVD rippers. The upgrade also makes the compatibility more extensive. In addition to RPC-2 DVD drive, WinX DVD Ripper accepts both general homemade DVDs and encrypted DVDs in spite of CSS encryption, RCE, UOP, Sony ARccOS, APS, and region code, etc. As for output formats, it can rip DVD to MP4, WMV, FLV, MPEG, H.264 and MOV without the need of any third-party codec that is even essential to the famous open-source DVD ripper Handbrake partially, and backup DVD to iPod, iPhone, Apple TV, PSP, Zune and Zen with corresponding profiles for each respectively. This fastest free DVD ripper can also extract DVD to MP3 music file, and grab images from DVD to BMP, JPEG. Besides, WinX DVD free Ripper has been rebuilt and reformed thoroughly to be more complete in function and more perfect in performance. More specifically, it is garmented with new UI enabling easier use and more convenient operation without complicated parameter settings. The DVD ripping and conversion of this free DVD ripper is more stable. Additionally, configured with quality enhancing engine, it is enabled to output video with faultless visual effect. All in all, WinX DVD Ripper is the most ideal free DVD copy tool with fast speed, wide output format range, powerful ripping ability, lossless output quality and easy use. Digiarty Software, Inc. is specialized in multimedia software based on Windows, Mac OS and iOS4, which provides personal and home used video audio software across Apple iPhone, iPad, Sony PSP, PS3, Xbox, Droid platforms and devices, including DVD Ripper, Blu-ray Decrypter, HD Video Converter, DVD Author, DVD Copy, etc.